Spanish cuisine offers many treasures to locals and visitors alike, though few dishes can match the worldwide popularity of tapas. 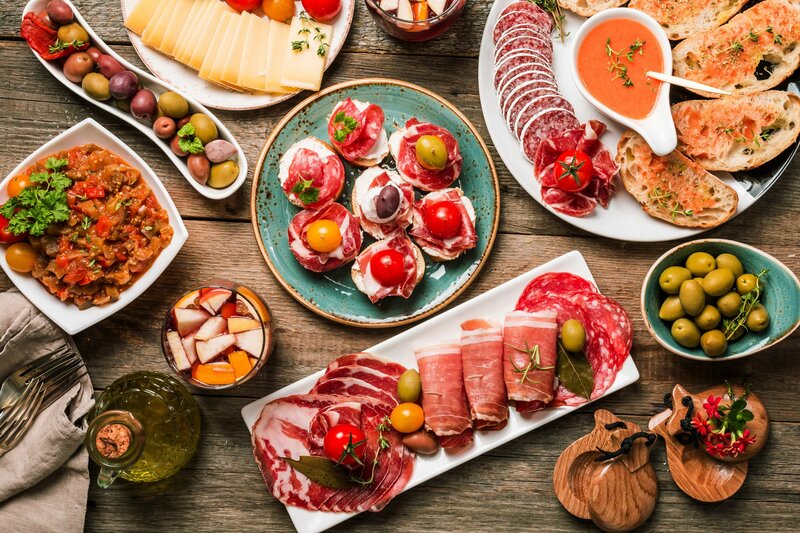 In fact, tapas are so popular that they've been adapted into other cuisines, from cocktail parties to a spin on the classic dinner gathering. But before you settle in with a glass of wine and tapas in Malaga, why not learn the history of this popular dish? What are tapas? Keep reading to find out more. Spanish tapas are a wildly popular form of Spanish cuisine. They're small plates, canapes, or snacks that are perfect for a family dinner or a party. What's in tapas depends entirely on who you ask--they can include almost anything. There's a huge variety ranging from sweet to savory to spicy and everything in between. One tapas must-have is patatas bravas- golden potato wedges served with spicy brava sauce, garlicky aioli, or both. Not your style? Try la tortilla espanola, an omelet made with egg, potatoes, and onions, or pan con tumaca, country-style bread smeared with tomato and olive oil and topped with cured meats. With so many foods in the popular tapas vernacular, there's a lot of debate about where tapas come from. Much like the style of food, tapas doesn't have one complete history so much as a competing collection of origin stories. The most popular story is the story of King Alfonso X of Castille in the 13th century. The king grew ill and found that, while recuperating, he could only consume small amounts of food and wine. This method proved quite successful and the king found it so pleasurable that he proclaimed that drinks could not be served without accompanying food (a prudent decision, given the number of drunken sailors occupying inns around Spain). An alternate story claims that tapas originated in the Middle Ages. Workers toiling in the summer heat couldn't take the midday siesta that normally accompanied the main, heavy midday meal. Instead, they took a light meal and a glass or two of wine to brighten their spirits without causing drowsiness. Of course, tapas have evolved a great deal over the centuries. Today, tapas is a form of eating out that's so popular it often replaces long, formal, heavy meals. Tapas is so popular it even has its own verbs in Spanish: tapear, meaning "to have tapas," and picar, meaning "to pick at," used to describe the way you would eat finger foods. Want to Experience Genuine Tapas Firsthand? Of the many benefits of living in Spain, regular access to good tapas is definitely on the top of the list. Knowing the answer to the question, "What are tapas?" the real question is, "Why aren't you eating tapas yet?" Want to experience Spanish culture yourself? Looking to move out of the U.K. and into the warmth of Spanish daily life? We can help make that dream a reality. We offer all sorts of properties for whatever your needs may be, from luxury properties to beachfront properties to commercial and bargain properties. Want to start the process of moving to Spain? Contact us today to see how we can help.